I have never met people who do not like cashew, I am definitely one of its fan. Indonesia is among the top ten cashew production country in the world, one of the reason we are so familiar with this nut. We call it kacang mete in Indonesian, kacang means nut and mete is for cashew. Sometimes we call it kacang monyet, monyet is monkey in Indonesian, not sure how it gets this name though … I prefer kacang monyet, sounds cute :). Both names can be used interchangeable. 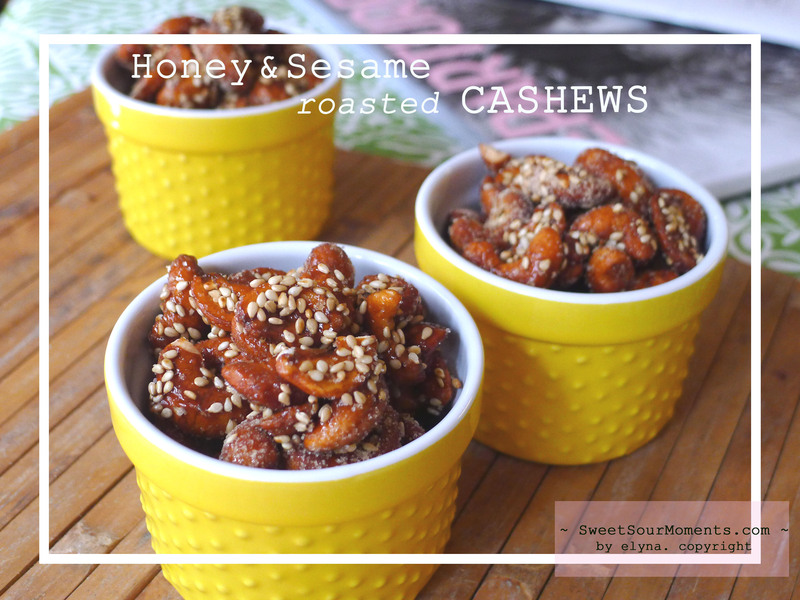 This time I am making Honey Sesame roasted cashews. After searching the recipes, here is my version which is quite simple and tastes good. 1. Put 2 cups of raw cashew in baking pan, bake in 300F for 10 minutes until golden brown. 2. Combine 1 tbsp butter, 2 tbsp honey and 1/4 tsp cinnamon in small pan, bring to heat, stir until the butter melt and all well combined. 3. Coat the cashews with honey mixture well. 4. 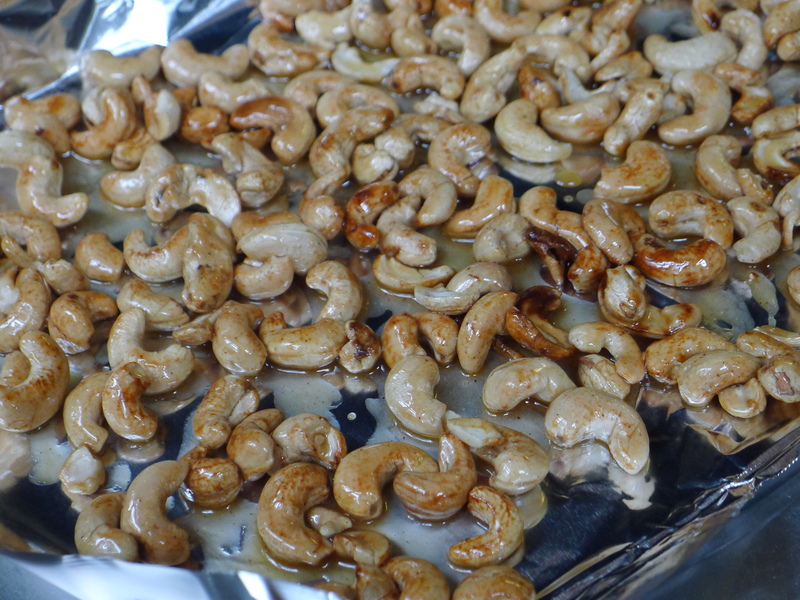 Cover the baking pan with aluminum foil before transfer the honey coated cashews onto it, spread them in one layer evenly. ( please don’t skip this step if you don’t want to end up cleaning sticky pan ). 5. Put back in oven for 15 minutes, let cool for 1 minute. 6. Take out the cashew and coat with the mixture of 3 tbsp brown sugar, 1/4 tsp salt, and 1/3 cup roasted sesame. Tips : make sure you move fast to get the cashew coated in last step. Once it is cool the honey coating will harden and causes the cashews stick to the sheet, also makes it difficult to get it coated with sesame mixture. I had to put them back to oven several times to make them melt slightly before continue with coating. welcome! hopefully fits your taste. I made your Cashews this afternoon and i LOVED them so much I posted about them 🙂 And I linked my readers to you for the recipe. Thank you again, and hopefully you’ll have some new visitors to your great site! Glad to hear that, thanks for linking my site!!! Thanks. Hope this isn’t a dumb question. …I don’t cook so I wouldn’t know raw cashews from roasted. When you buy them at a grocery store in a can or bag, I’m assuming those have been roasted already. If raw nuts aren’t available, can roasted be used or is the roasting of the raw nuts important to the final taste? Thanks. Yes you can use the roasted one, I don’t think they will taste much difference.